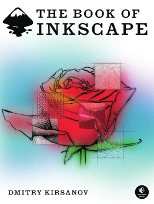 “The Book of Inkscape,” by Dmitry Kirsanov; $45 from nostarch.com. “Inkscape” is a free graphics program that is winning converts from the low-cost “Xara Extreme,” which in turn has won users away from CorelDraw, which was a cheaper alternative to Adobe’s very expensive “Illustrator.” Basically, what you have here is a market progression from costly to cheap to cheaper to free. This book is a great guide to using Inkscape. Besides covering all the features, it includes excellent tutorials on how to design a business card, create an animation, make a three-dimensional cartoon, or an artistic drawing, or a technical drawing. The author, a website designer, says Inkscape is part of the “vector” revolution. Unlike bitmap editors such as Photoshop, vector drawings can be enlarged without getting the “jaggies,” those jagged edges you can see in low-resolution bitmap drawings and type. The program works on Windows, Mac or Linux. We’ve been using Corel Draw, which is especially good for painterly results but have been frustrated with the indistinct edges. We’re hoping that Inkscape will provide clean, crisp lines/edging, also 3-D modeling capability. Looking forward to trying out this software. The “Book of Inkscape” sounds like the best guide. I received an offer from a company that says it can improve my website’s conversions. What does that mean?